Aerial advertising is an extremely powerful form of marketing. 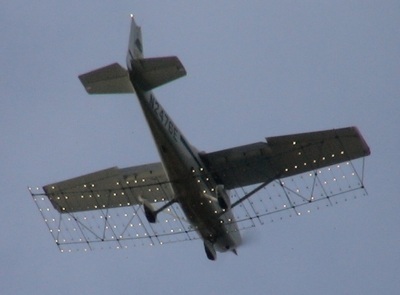 Not everyone will think twice when they see a plane fly by, but a banner trailing behind it or an electrically lit sign in the night will surely demand a crowd’s attention. The message is large, it turns heads, and most importantly, it is memorable. According to Skyspot Advertising, aerial advertising grabs 88% of an audience’s attention and 79% of those recall what was being promoted. Whether they chose banner towing or an aircraft equipped with an electric sign, for marketers aerial advertising just makes sense. For pilots, it’s a grand business opportunity and a lot of fun! A pivotal aspect of every successful business is the budget, even more so when it comes to commercial aviation operations. There are plenty of expenses to consider, especially when it comes to protecting your operation with aerial advertising insurance. Not all insurance policies are the same and not all insurance agents are either. All of the agents at Aviation Insurance Resources (AIR) are pilots and understand the proper questions that need to be asked about your business. Our goal is to provide you with a policy package to protect your assets in the event you were to be held legally liable for property damage or bodily injury. Coverage can also extend to physical damage of your aircraft and equipment. AIR will provide you with not only the broadest coverage available, but at a rate that does not upset your company budget. We shop all of the major aviation insurance markets that are competitive for aerial advertising and banner towing, therefore offering flexibility when it comes to choosing an insurance policy that meets your specific needs. In addition, we are licensed nationwide in all 50 states to serve you better! If you are looking to start up an aerial advertising firm, tow banners from time to time, or just wish to take a new look at your insurance rates, give the aviation experts at Aviation Insurance Resources (AIR) a call at 301-682-6200. You can also complete and online quote request today! To learn more about AIR you can find us at www.AIR-PROS.com, Facebook, Twitter, Instagram and LinkedIn! PreviousPrevious post:The Truth Behind Avemco SolicitationsNextNext post:Q: I own a flight school. Should I require my renters to have insurance?